Fr. Chris made a statement in last week’s Bible Class that stayed with me all week and became the lens through which I read and meditated on this week’s Gospel. He said that even though the Scriptures are clear that we are to trust in the Lord, if we are honest with ourselves we will admit that it is more difficult to do than it sounds. Then when I read in this Gospel Jesus’ call for us to repent, I thought back to Fr. Chris’ statement and realized that one of the things of which I need to repent is my failure to trust. I do not think I am alone here and I want to suggest to you that our failure to trust is the result of both mistrust and distrust. Allow me to explain. When I say mistrust I am not thinking of failure to trust as much as I am thinking of misplaced trust or trusting in the wrong things. The Bible warns of this. Psalm 20 says, “Some trust in chariots and some in horses, but we trust in the name of the Lord our God. They collapse and fall but we will rise and stand upright.” It’s not that there was anything inherently wrong with chariots and horses. In fact they were even the means by which God gave them victory over their enemies. But Israel’s trust was to be in God and not in the might of their military. On D Day June 6, 1944 President Roosevelt got on the radio and asked the nation to join him in prayer. This is some of what he prayed. With Thy blessing, we shall prevail over the unholy forces of our enemy. Help us to conquer the apostles of greed and racial arrogances. Lead us to the saving of our country, and with our sister Nations into a world unity that will spell a sure peace a peace invulnerable to the schemings of unworthy men. And a peace that will let all of men live in freedom, reaping the just rewards of their honest toil. Thy will be done, Almighty God. Amen. This prayer should be a model for us. If we think that we will defeat radical Islam by the power of our military alone, if we are not in prayer, then we are trusting in horses and chariots. The Scriptures tell us that our warfare is not with flesh and blood but with principalities and powers. Thus the Church needs to be in the kind of constant prayer that the President spoke of because the kind of principalities and powers that are behind radical Islam are not defeated by bombs and bullets alone. Scripture gives us another warning about misplaced trust. Proverbs 3 says, “Trust on the Lord with all your heart and do not lean on your own understanding.” One of the ways that people lean on their own understanding is through their rejection of any and all authority including Holy Scripture and the teachings of the Church. When they do this then they become the arbiter of truth. They make themselves the sole authority. The result of that is an Oprah-like religion where you paste together all the things that you like and reject all the things that you don’t and God Almighty begins to look like a kindly Mr. Rogers, who exchanges His robe of holiness for a comfortable sweater and even the blasphemer is welcome in his neighborhood. If you are truly seeking the truth, then you need to know that you will not find that kind of “god” in the red letters of the New Testament. That is not who Jesus preached nor manifested to the world. The Holy Scriptures are not man’s reflections about God from which we can pick and choose. They are God’s self-revelation and we read, learn, mark and inwardly digest them so that we can know God as He truly is. Trusting Him therefore includes trusting His Word and letting it, rather than our own understanding, be our guide. Just as with horses and chariots, there is nothing innately wrong with money. You will hear people misquote the Bible all the time by saying “money is the root of all evil.” But that, of course, is not what the Bible says. Money is not the root of all evil. Money can be a great source of blessing when properly stewarded. It is the love of money that is the problem. It is not money but trusting in money that makes it difficult to enter the kingdom. Our trust is to be in God. Why even our money tells us so! 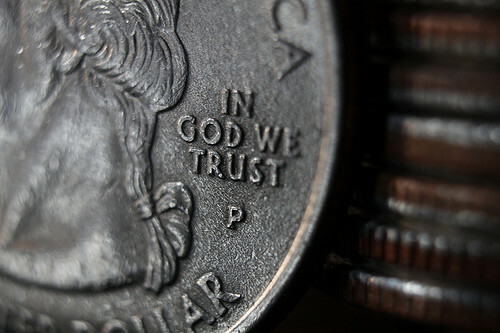 How do we know when we are trusting in money rather than God? One way is when we hoard it for ourselves and act as if God is incapable of meeting our needs. Another way is when we place the making of money to be the priority of our lives and fail to seek first the kingdom of God. When God gave manna to the children of Israel to eat while they were in the wilderness, He told them to collect just what they needed for the day. If they tried to hoard it, it turned to worms. But on the day before the Sabbath they were to collect for two days and it would remain good. When they obeyed Him and did not hoard it and when they obeyed Him and did not work on the Sabbath to collect it, they were demonstrating their trust in God to provide. We need to follow their pattern. We are to trust in God and not in our riches. That is again why we must read, learn, mark and inwardly digest Holy Scripture because it is through God’s self-revelation that we learn that He is not like our parents or our siblings or even like our close friends. It is through Scripture that we learn of His character and attributes and the more we learn of them the more clearly we see how He is deserving of all of our trust. A number of times He is referred to as a Rock because we are to see Him as unmovable and unchanging in His love and mercy and grace towards us. But contrary to much teaching today, the Scripture does not promise that if we put our trust in this Rock that we will be shielded from all harm. Joseph, David and Job were men of exceptional trust but they all knew both weal and woe. Job especially stands out both for his relentless suffering and his tenacity in saying, “Though He slay me, yet will I trust Him.” We don’t trust Him so that everything will be perfect, we trust Him because He is perfect…perfect in His love towards us. Jesus as our coming King has inaugurated the kingdom of God. What the prophets spoke about is here and it is now and it will come one day in its fullness. The good news is that because the kingdom is here and now we can start living in that kingdom here and now. We can be in this world but not of this world. While the culture acts out some Darwinian nightmare of dog eat dog and only the strong survive, we can live in a kingdom where we feed the poor and visit the sick and discover that it is more blessed to give than to receive. While society idolizes Miley Cirus for her self-serving outrageousness we live in a kingdom where we honor women like Mother Theresa for her selfless humility. In a world that worships the rich and powerful, we live in a kingdom where we worship the One who washes the feet of His disciples. Because Jesus has inaugurated the kingdom of God we are now ambassadors of that kingdom and we are to pray and work until His kingdom comes on earth as it is in heaven. This is not something we will accomplish through our own efforts but it is what He will accomplish when He comes in glory and makes all things new. Our most immediate task is to repent of our lack of trust and to believe in and live in this kingdom. I taught myself a lesson on the benefits of repenting and believing last week. I was driving to a meeting in Brentwood and while I kind of knew where I was going, still I was not certain. So I opened a navigation app in my Ipad. As I was approaching Brentwood I passed where I thought that I should turn but I heard nothing from the voice of my navigation app so I kept driving. I didn’t want to get lost and be late for my appointment and my anxiety started to build as I kept driving and not hearing any directions. I then started a debate in my head. I realized that I can either stay full of anxiety or I can relax, trust the app and enjoy the ride. I decided to do the latter and when I did it hit me what a parallel that was to my spiritual life. I can either go through life filled with anxiety and trying to take control or I can trust God’s navigation and enjoy the ride. By God’s grace I will do a lot more of the latter as I repent and believe the good news. I want to challenge you to join me in this and let’s enjoy the ride together. Amen.